When a PaperbackSwap package arrived the other day, I realized I had to write another post for YLCF’s “Snapshots of Favorite Books”. 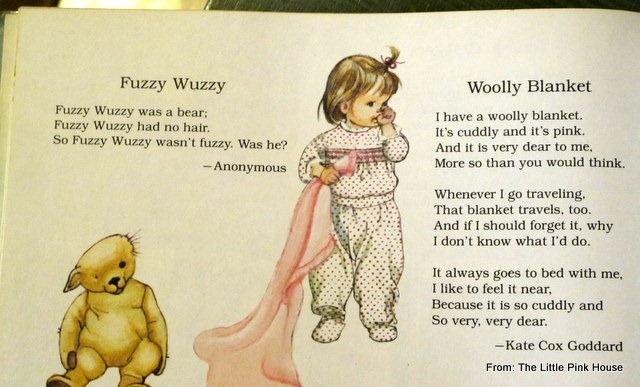 I grew up with a pink blanket and “Fuzzy Wuzzy was a bear…” and “The Goops.” My brother and I (not to mention our mom and dad!) could quote many of the poems from memory. 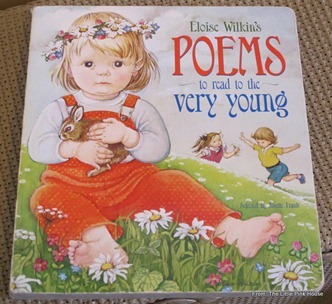 But Eloise Wilkin’s Poems to Read to the Very Young was one of the books that my mom didn’t want to part with. So I set out to find my own. 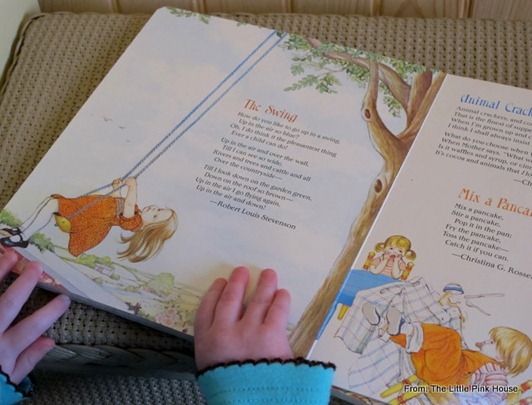 The first time I ordered a copy from PaperbackSwap was when I discovered that they’d reprinted these beloved poems and winsome illustrations in board book form. 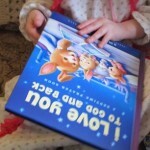 I was delighted to discover that the collection is now more readily available, especially in a form I can let my girls look at it without fear—but alas, the board book didn’t have all my favorites (neither “Fuzzy Wuzzy” nor “Woolly Blanket”!). That didn’t stop me from getting more copies to share my beloved Eloise Wilkin with friends. 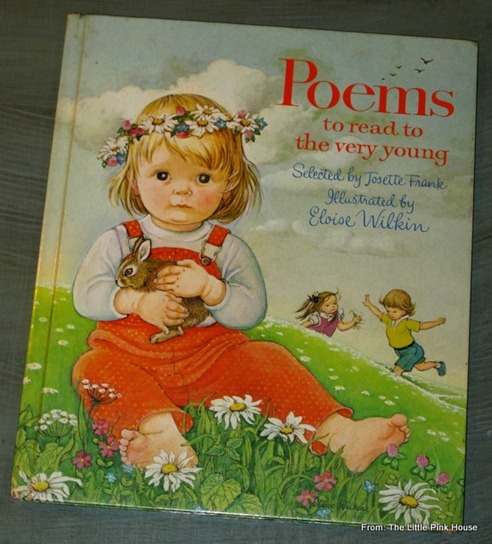 But I searched long and hard to find the tall hardback copy I grew up with, which contained 70 poems (more than double what they reprinted in the board book). I was finally rewarded on PaperbackSwap with a 1982 copy that was not only just like mine, but just like new! 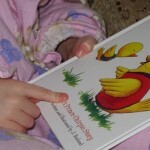 Now I can read to the girls about Fuzzy Wuzzy (as if I didn’t already have his lines memorized) from the book just like I grew up with, and they can still enjoy perusing the pictures at their own pace in the board book. It’s a title that just might have to stay on my PaperbackSwap wish list, so that I can continue to collect more copies to give to friends—not to mention to have on hand for when my girls leave home someday! I have an idea they might be even harder to find then. P.S. If you learn to love Eloise Wilkin, you’ll have to find My Goodnight Book and My Good Morning Book, too. 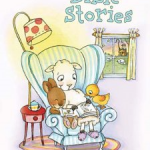 Read about my friend Amanda’s favorite Eloise Wilkin tales here. Because what better way is there to revisit childhood than to read favorite titles from childhood? Is “Lickety Lick” by May Justus in that book? I’ve seen a page copied in Pinterest that has her poem with the Christina Rossetti poem about pancakes, but I can see from your photo and your explanation of the illustrations that that other page must be from a different edition. 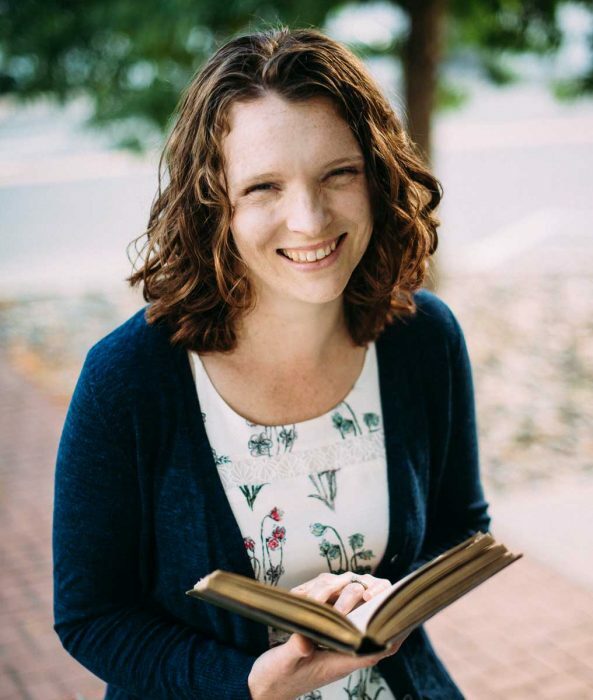 I have a long bibliography on May Justus at http://www2.ferrum.edu/applit/bibs/justusBib.htm, but tracking down individual poems and articles is not easy. “Lickety Lick” is not a familiar poem at all, and not in any of the versions of Poems to Read to the Very Young that I have on my shelf. I’m sorry! Do you still have this book? Can I have the ISBN please? My original copy was burned in a house fire. I finally found a copy and received it tonight only to find Fuzzy Wuzzy missing and another poem in its place. Thought I was going crazy until I saw your picture of it. I’m in need of the exact copy I received at my birth in 1985. Oh Jessie, I’m so sorry to hear about your house fire. I’ve often thought how hard it would be to replace a library that took years to build. My husband reminded me that we have two versions of this book, one of which does not have “Fuzzy Wuzzy”. 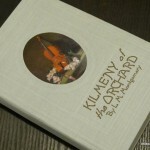 But the one which has that poem has the ISBN of 0394851889. Hope that you can find it! thanks for trying to help. Unfortunately The copy I have is also the same ISBN. I feel like I’m just going to have to buy this book a million times before I get the right version. Why must they torture me so?! Oh how strange! Why oh why would they eliminate that poem, of all poems?! I wonder about trying to find it through eBay. That way you could ask the seller if Fuzzy Wuzzy was there before you bought it? If I had an extra copy with that poem I’d send it your way! My mom is a huge Eloise Wilkin fan and has been collecting her books too. I love those cherub baby drawings; so adorable! We don’t have the poetry book (the one with 70) but we have a few others which I just adore.